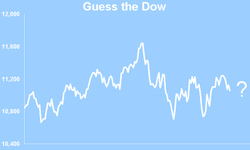 The Dow Jones Industrials closed today at 11986.04. Three of our Guess the Dow participants ("paulo", "Buck", and "KX") guessed within +/- 5 points, which means (by our new and improved rules) that they will each receive two free months of the Birinyi Newsletter Service. For those who didn't catch the new rules, anyone within +/- 5 points wins two free months of our service, and if no one makes a guess that close then the closest guesser will receive one free month. 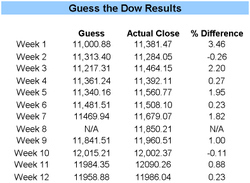 Below you can track our historical "consensus" guesses, which was fairly close this week. We'd like to remind everyone that you can only guess between the time of this posting and Monday's 9:30 open. I see my name on the winners list… Haven’t got an email yet….. Where is my prize???? ?